The 14th Annual Conference of International Foundation of Fashion Technology Institutes (IFFTI) in Jaipur, India, officiated by international fashion diva Missoni, was a rare and exciting session of cross cultural learning providing stimulus for creativity and innovation to the students. PJCAD students in the ‘Pink City’. “The thoughts and vision on fashion trends shared by leaders like Missoni and Aronsson, along with issues addressed including multicultural identities, virtual connections, commercial opportunities, educational responses and more ensured that the students acquired a good understanding of the opportunities and challenges in the global fashion and design industry,” said Es Azren, PJCAD’s Fashion and Industry Head. Hosted by Pearl Academy of Fashion, a globally renowned education institution with campuses in New Delhi, Noida, Jaipur and Chennai, PJCAD Fashion Design students thoroughly enjoyed their three-week tour of discovery and exposure that included educational workshops, visits to craft markets and studies on Indian culture and heritage, creative textiles, and arts and fashion. Jaipur, dubbed “Pink City”, proved to be a rich source of fabrics, jewellery and accessories that provided the students with abundant materials and inspiration for their handiwork and designs. They witnessed craftsmen at work on miniature paintings, block printing, bangles and other delicate items, applying time-honoured skills and techniques. Aside from sharing a common denominator in offering fashion related courses, both PJCAD and Pearl Academy of Fashion are part of Laureate International Universities, the largest and fastest growing network of private universities in the world. 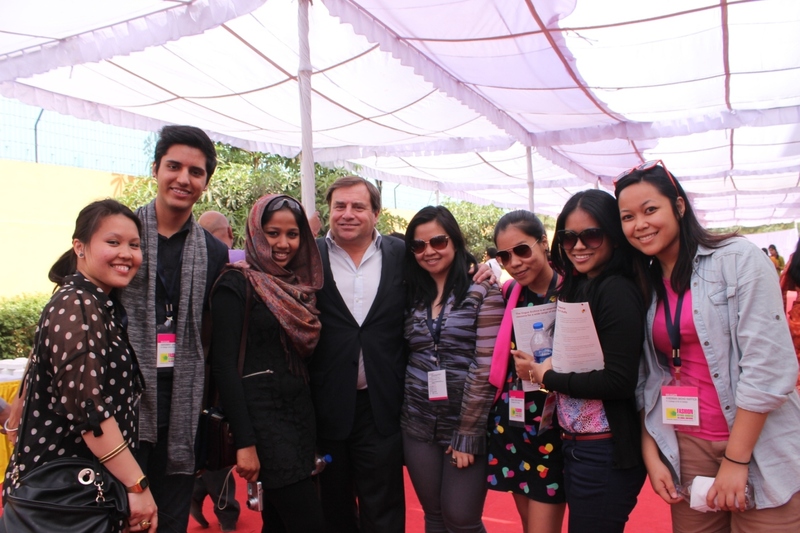 PJCAD students with Jeffry Aronsson (4th from left) at IFFTI. Internationalism is an important pillar that holds up institutions of the Laureate network and the opportunity for members such as PJCAD and Pearl Academy of Fashion to share knowledge, thought processes, best practices, academic talent and resources across the distances makes this ‘Laureate advantage’ a unique one. PJCAD’s Diploma in Fashion Design programme aims to develop students’ ability to conceptualise and produce fashion designs of recognised international standards to meet the changing needs of the global textile and apparel trade. It ensures students will have a firm foundation in research, design methodology and practical skills in drawing, communications and fashion designing for a successful career in the fashion industry. One of Malaysia’s premier specialist private art and design institutions, PJCAD nurtures and guides every student until their inherent potential is unlocked with creative input by its team of industry-trained instructors who ensure that every student is versatile, adaptable and able to understand the constantly evolving demands of the industry.PJCAD is a member of INTI, which in turn is a part of Laureate International Universities – the world’s largest private education network. Students considering PJCAD will not only benefit from the years of experience and strong track-record that INTI offers, but also gain from the global synergy and resources that Laureate provides. Laureate is present in 29 countries, and serves more than 675,000 students globally. To learn more about PJCAD’s Fashion Design programme, please call 03-7957 2000.